Two things about Mecca are astounding: the Ka’aba & the people. I’ve talked about the Ka’aba, it’s the people here that are just as interesting. This is the people-watching capitol of the world. I’ve been sitting in the same spot for over an hour, on a street leading away from the Haram. It’s almost 7am, I’ve been here since after Fajr. I swear, hundreds of thousands of people have walked past me. All kinds of folk. I’m sitting near some that are seemingly poor & it’s comforting to be in their company. Their way is simple & they’re kind. I want to give to them in sadaqah (charity), but I don’t want it to be insulting. While I’ve been sitting here, people have already stopped, while walking past, and given them money. I don’t know why it hadn’t occurred to me earlier to give sadaqah, but now I’m excited at the opportunities. I think I’ve seen people that could truly use it – not just professional beggars and panhandlers, which are also out here in an abundance. I want to take advantage of the opportunities to help those in real need iA. There’s a West African man that’s been sitting in the street for the past 45 mins, on two scraps of cardboard, just making dhikr (remembrance of Allah). People came and dropped money in his lap & I swear it didn’t phase him one bit. He continued to sit & look around as if nothing happened. The bills fell to his side and he didn’t even reach out to grab them. That image just sticks with me, it’s like there was just no desire for anything worldly, subhanAllah. If he’s still around later, I’d like to get him a rug to sit on, to maybe bring him some comfort at least. People also gave money to the workers picking up trash. They humbly accepted & I was surprised I didn’t think of that either. The workers here are, generally, in need. It makes so much sense to help them out, considering they’ve probably come so far to find work, leaving behind their families. Maybe my heart was being prepared in these last few days? At first, my focus was only the Haram, the building, the Ka’aba, the place. Slowly, I’m seeing & realizing the even greater significance of the ummah (nation). This is more likely the real reason behind the significance of this journey. We’re meant to connect with our fellow man – with those in need & those different from us. To feel compassion for them & recognize them as humans like ourselves. Glaringly so. I’m utterly surprised at how entirely unspurprising people have been, on an individual level. Everyone is the same everywhere. It’s beautiful & comforting – though also somewhat of a letdown, sure. You hope everyone would be enlightened or somehow, mystically, unexplainably, different. But, we’re all as we’ve been created. We share our humanity so much more than we give each other credit for. It’s especially inspiring when I imagine that, if everyone in the world is essentially the same, than this is the essence of humanity. People of old were just the same as us. Such is our nature, any other way would be unnatural. So, the Prophet knew his people, by proxy he knew us, we are all the same. What this message has done for them is what it can do for us. Sincerity and dedication in the hearts of those who understand is how we will prevail. This place is beautiful because we are beautiful and this place brings us all together. I pray that I may take with me these lessons & benefit from them, finding ways to implement them. It’s been hugely influential to grasp that we have a common point of reference. Often, almost as a norm, I assume things don’t apply/refer to me. I assume that even those applicable are foreign to my understanding. This experience proves otherwise. I am as human & as common as everyone else here. I am, rightfully so, another face in the crowd. It is not an insult, but rather my God-given right & privilege to share the beauty of humanity with you all. This place helps me to grasp that we are in fact brothers & sisters. Not in Islam, not because Adam was our shared father, not even because we’ve said it enough times that we don’t even question it anymore. 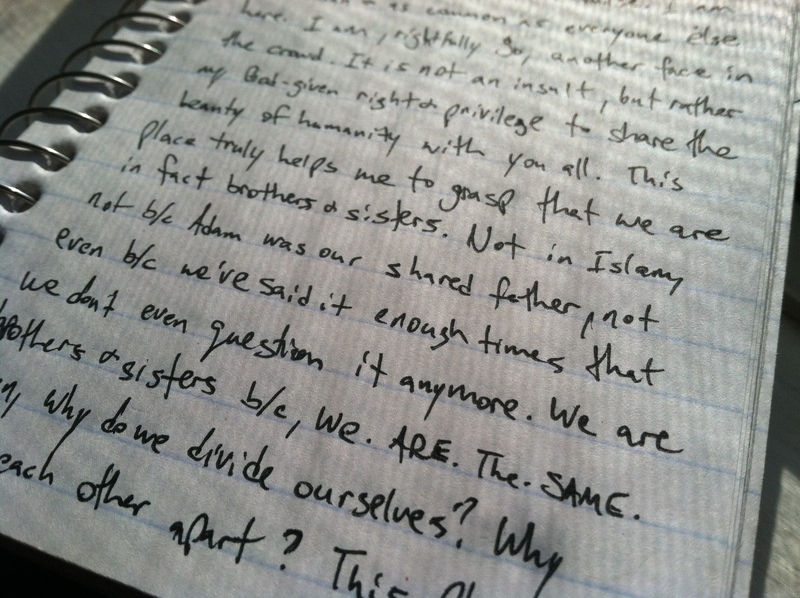 We are brothers & sisters because WE.ARE.THE.SAME. Then, why do we divide ourselves? Why keep each other apart? This places such divisions in our hearts – something I feel leads to doubt & discontent. Doubt in Allah’s all-encompassing, ever generous Mercy, and discontent with our state – being lonely & disconnected. There is a love that emerges in the hearts when company is shared, incomparable to a love for anything else. Our hearts purify one another when we open them to our brethren. We are the cures for our own diseases. We may all carry common coughs & runny noses, but while we are together & sincere – we will never share greed, malice, envy, deceit, or ill will. Maybe it is the magic of this place that keeps us especially kind. But, I believe we all carry that kindness & goodness, readily, from birth. May we all be restored to our fitra (natural state) and experience the swelling of the heart upon sharing it with one another. While I was sitting there, writing, a man came and sat beside me. I could tell he was trying to see what I was doing while puffing on his cigarette. After about 15 minutes, he finally says to me, “Arapi?”. I realize he’s Turkish. I shake my head, “Pakistan.” He nods, places his hand on his chest, “Turkiye”. I smile and nod, and continue writing. After a few minutes, he pulls out his cell phone, an old flip phone. He tinkers with it for a few seconds and then some music comes on. He holds it in his hand while he looks out into the street, continuing to smoke. I’m thinking, that’s…cute. He must really love his music. I recognize the song, it’s a Sami Yusuf track. The one off of his last album where he sings in Arabic, Turkish and Urdu. I didn’t say anything and continued writing. After the song ended, he lingered a few minutes longer, than got up and walked away. I thought, hmm, that was…odd. I realized after he left that he was trying to use music to connect. He had played a song that both of us could understand, there were lyrics in Turkish and in Urdu. SubhanAllah, what an awesome effort. I missed the opportunity though. I was so wrapped up in analyzing my environment that I took myself out of continuing to experience it. I cut myself off from the blessings. Just one of the things I regret. My heart goes out to the Bengali people. Their eyes carry such a softness & innocence that touches the heart. Perhaps, if they live in poverty, it has made them content. May we all be so blessed. I just ate a liver & french fry pita sandwich, thinking I had ordered a shawarma. I need to learn some basic Arabic conversation. It wasn’t bad at all though. Go figure. If we are the same, my advice to you is, write. Write everything. It clears the mind & helps it to grow. Thoughts built up are preserved, leaving you comfortable to welcome new thoughts into the brain. I would also say, be with people. Be with people, those you know & more whom you do not know. Be with them, watch them, empathize & understand them. Listen to them, and when appropriate, talk to them. Listen not just to their conversation, but to their silence. Be especially mindful to listen to what they don’t say & how they don’t say it. There are volumes in the unspoken. Be one who watches, listens & understands. Your heart will grow & you will experience a love like no other. I wanna learn Bangla, Arabic, Farsi, Turkish, and Dari. K bye. I’ve primarily been exploring the Southern side of the city. I finally got acquainted with the “heritage souq”, the real marketplaces. It was glorious :). It was awesome to see everyone hustling their wares & people making their purchases left & right. Today is the last day we’re in Mecca. We’re heading to Medina for the next few days. When we head back, it’ll be for Hajj, iA. Looking forward to visiting the Prophet’s city, though I’m sad to leave the place of his birth. Hopefully, I’ll be able to rest on the trip & catch up on my writing. I’ve been cut off from my phone for about 4 days & it feels so liberating. No worries about being called & interrupted – things can naturally develop & be organically experienced in their entirety. There’s far less distractions now. The only time I’m not “present” is when I write, and in those moments, I am completely present within myself, which is not a distraction in the least. I’m hoping to be able to engage in further bouts of technology vaccum-living, at least somewhat periodically. I’m discovering myself anew and it’s so relieving & calming. I miss days when I was more in touch with myself, before cell phones really took over my life. I’d say freshman year of college was the last time I felt this deeply contemplative. 8 years of shallow thought, show yourself out. SubhanAllah, that was a very well written post. You really took me with you on that journey.. May Allah bless you and accept all your dues.